Let’s talk about the three reasons a Christian counselor or marriage coach is essential to your recovery from broken trust in marriage. From the moment betrayal becomes a part of your marriage, you’re left wondering what you should do next. It seems natural to share your pain with those who are closest to you, but all that usually leads to is a lot of advice you’re not sure if you should take. Some of the advice you hear may be from other Christians who only want the best for you, while others begin speaking out of their own anger with little to no concern about what the future might hold for you. It’s natural to feel like you’re stuck. You may even feel hopeless and worried about what the betrayal will mean for your family. 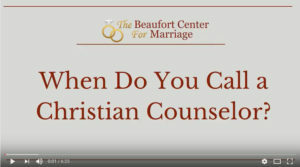 A Christian counselor or marriage coach is the best resource you have available to you, and there are many reasons why. Betrayal hurts deeply. It doesn’t matter if you’re a husband who recently learned about his wife’s affair, or you’re a wife who discovered her husband had cheated on her. Betrayal causes pain that can sometimes become unbearable. Even so, you’re not sure what you should do with that pain. You want to be able to forgive your spouse, but you don’t know how that can even be possible. Talking with a Christian counselor or marriage coach will allow you to grieve properly, while keeping the truth in perspective at all times. You’ll be able to learn the steps of grief and work through the pain in a way that leads to healing. Reason #2: You desperately want to keep your family together…but how? As soon as you learn about your spouse’s betrayal, you immediately think about the hurt and pain it has caused you, and then you think about your family unit as a whole. Every year, many marriages end in divorce because of marital betrayals, and that means that a countless number of families are split as a result. More than anything, you want to keep your family intact, but you don’t know how to accomplish this. Here at The Beaufort Center For Marriage we create a personalized plan for you and can work with you on the proper steps to preserving your family. While it may be true that many marriages end in divorce because of betrayal, that doesn’t mean it has to happen with your marriage. Together, you can discover the truth in God’s Word about His design for your marriage. You may have reached the decision that you want to rebuild your marriage, but you also may know that you don’t want to enable the sinful behavior that led to the mistrust. It can be nearly impossible to decide what you should do if this is the situation you have found yourself in, and fortunately, many couples have been able to be successful. Let us help you walk you through the practical steps to rebuilding your marriage based on Biblical principles. You’ll discover that God’s will for your marriage is forgiveness and restoration, and you’ll learn how to get to that point with your coach providing you with guidance along the way. If you would like the opportunity to talk with a Christian marriage coach about the broken trust in your marriage, I want to invite you to contact us at support@beaufortmarriage.com or by calling 843-379-0288. Your location is no problem as we meet with individuals either face-to-face in our office, by phone or video call. You can also schedule an appointment by using our online scheduler. We are confident we can seek the truth in God’s Word, and work toward the resolution that is right for you and your marriage. ← Is Forgiveness the Same as Reconciliation?